Civic Change, Inc. is the successor organization to the Pew Partnership for Civic Change. A civic research organization, Civic Change, Inc. provides consulting and program support to communities, governments, foundations, and nonprofit agencies. We help clients identify and implement solutions and strategies crucial to making communities stronger. The Pew Partnership for Civic Change was established in 1992 as a civic research organization with primary funding from The Pew Charitable Trusts. In 2004 the Partnership moved from an intermediary organization for the Trusts to a stand-alone nonprofit consulting firm as an administrative unit of the University of Richmond. It received funding from foundations, nonprofits, and governments. 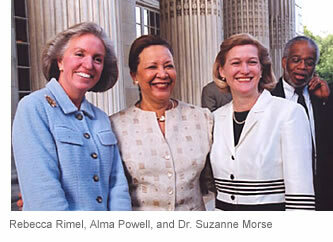 For more information about the history of the Pew Partnership, review this historical timeline. Civic Change, Inc. was established in 2009 as a nonprofit organization. We continue to work with a prestigious group of partner organizations and advisors in addition to our staff and associates. Our president is Dr. Suzanne Morse. What are the strategies that every community needs to be successful? What information do communities need to improve their outcomes on challenges and opportunities? How can we motivate and prepare more civic leaders to take active roles in their community? If these are among the questions which concern you, your community, or your organization then contact us. Building on three decades of collective experience improving the quality of life in communities of all sizes, we stand ready to assist you in your efforts. Read more about our work in our annual newsletter.